Shortwave of energy moving south of the area is firing up light snow and flurries for the area. Periods of light snow will be possible overnight and again tomorrow in the morning. The bulk of the snow will stay to the south of the area. 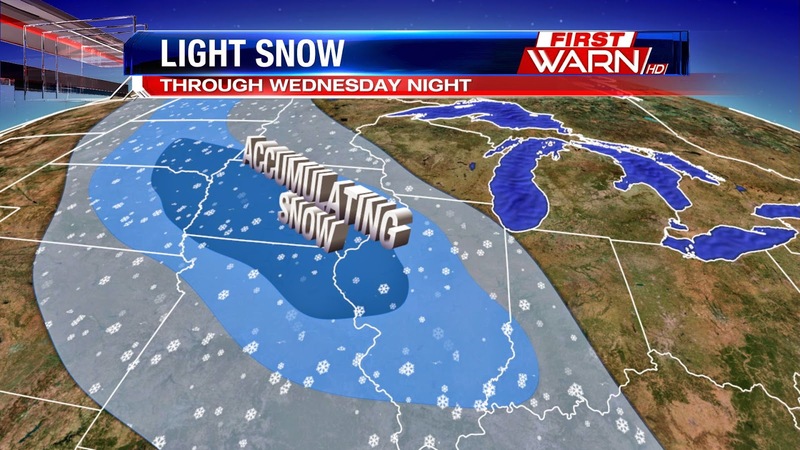 South of I-80 could see three or more inches and closer to 5" towards central Illinois. 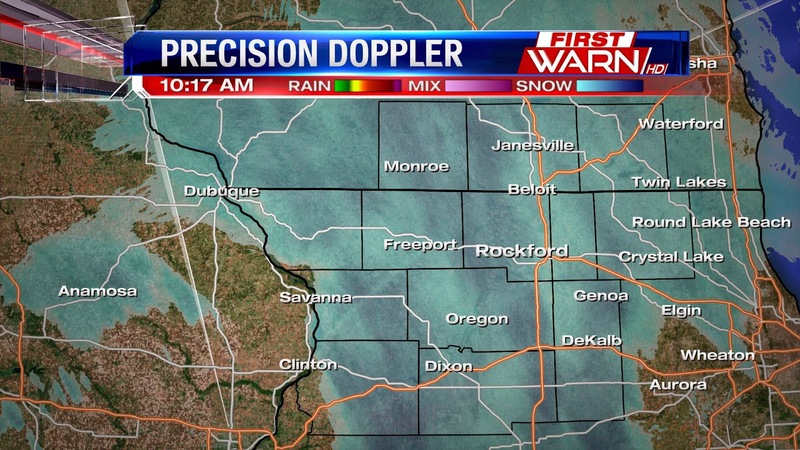 The farther north you get, into southern Wisconsin might only see a dusting if anything. Temperatures Saturday night won't be a cold as Friday night lows. Temperatures this morning hit 16 below, shattering the old record of -7° from 1962. Tonight we'll see temperatures in the lower teens, and single digits to the west where the cloud cover is clearing. Sometimes a small change in the weather can lead to a big difference between the forecast and what we actually see. 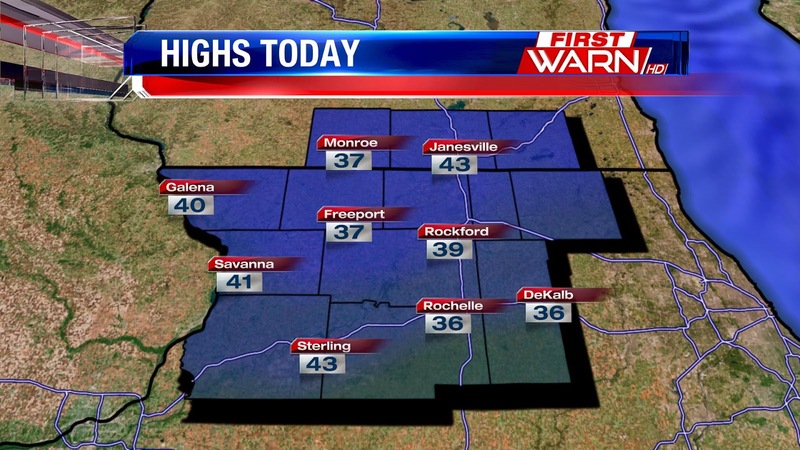 That happened Friday morning with our low temperatures thanks to the wind. 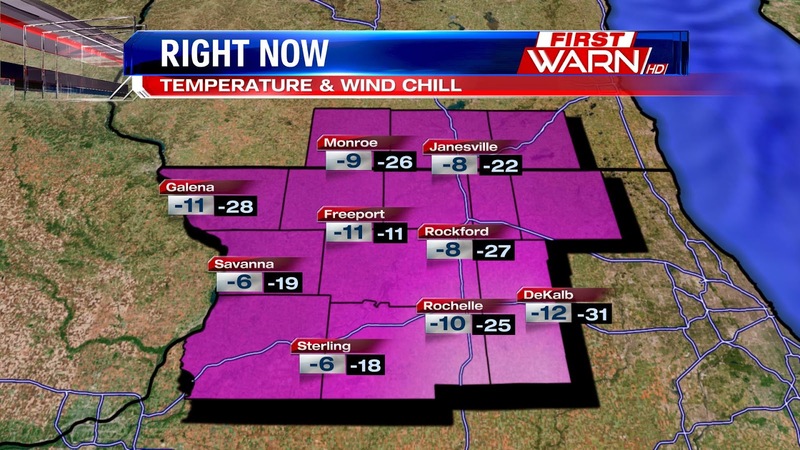 Rockford officially tied a record low Friday morning by hitting -15° at the airport. The other time we hit -15° was on this date back in 1994. The forecast was calling for lows around -8°, so what happened? In this case, we were expecting winds in the 5-10mph range for Thursday night and Friday morning. Winds help circulate the air, which keeps temps from cooling off as much as what we would see under calm conditions. 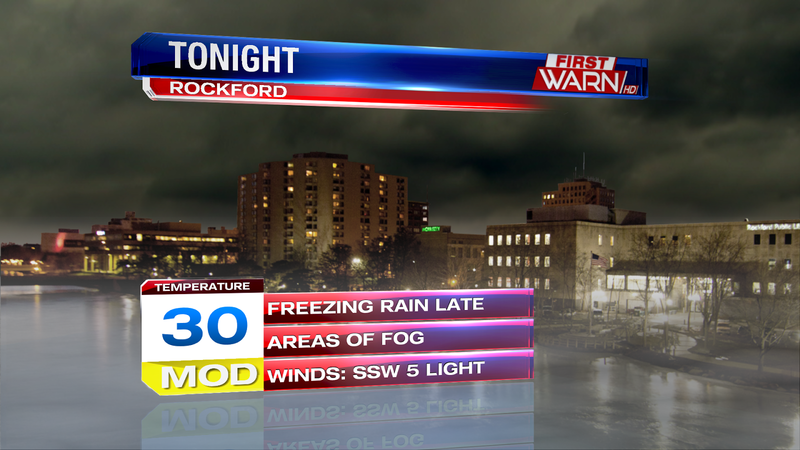 Check out the observations from the Rockford airport Thursday night and Friday morning. From about 8:00pm Thursday until 9:00am Friday, winds were non-existent. That's great for wind chills, but actual temperatures paid the price in the end. This weekend's snow won't be a major event, but we may need to get the shovels back out Sunday. Moisture from the Gulf of Mexico will be pulled north over the weekend as low pressure develops in the southwest. This moisture will run into a cold air mass over northern Illinois and southern Wisconsin with temperatures in the 20's. 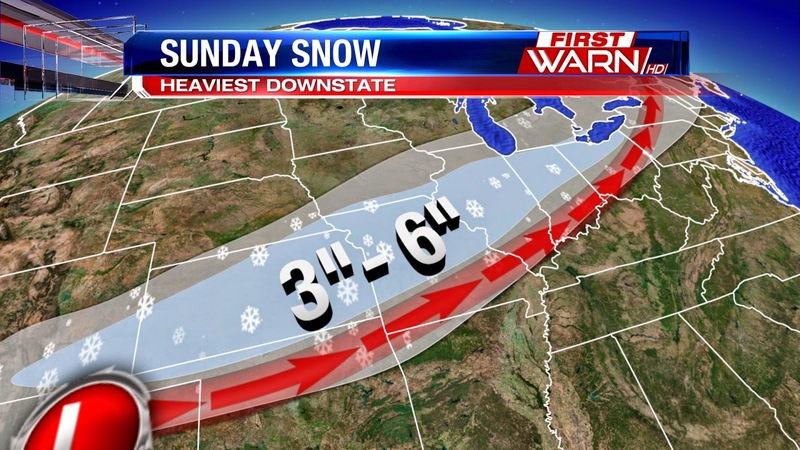 The heaviest snow band will occur downstate where upwards of six inches could fall. Closer to home, a couple inches will be likely in northern Illinois - a little less further north. There won't be a lot of wind with this, but travel could be impacted with the snow during the afternoon and evening. Once Sunday's system is done, we'll get a little break Monday before an even stronger low swings in Tuesday. This next system looks to have a little more moisture, as well as warmth with it. Low pressure will develop in the southwest Monday and lift through the Quad Cities to Chicago by Tuesday night. Northern Illinois and southern Wisconsin will be very close to the freezing line, 32 degrees. This means a mixture of freezing rain, sleet, snow and rain will be possible Monday night through Tuesday. Details are still be worked out as this storm is off the Pacific Northwest coast. With it, surface temperatures will warm in the middle 30's, but then likely drop back into the 20's for the remainder of next week. Stay tuned! Every morning, I always try to look for the positive. But this morning, that may be a little difficult to do with temperatures as cold as they are. 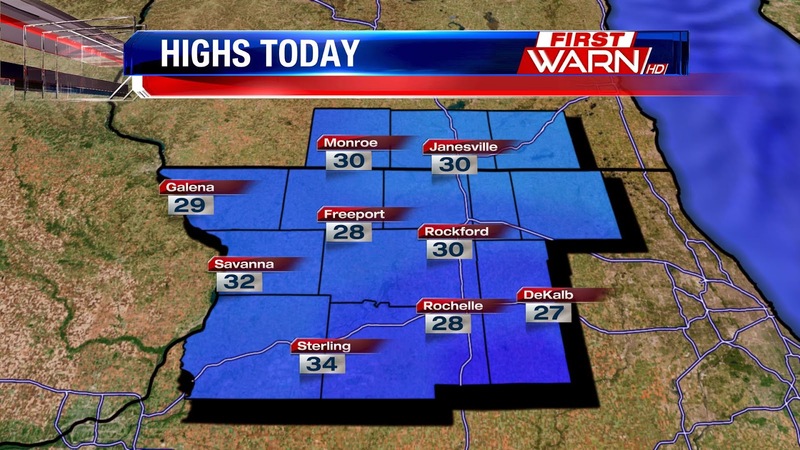 Overnight lows fell as cold as -20° in some locations, especially west of Rockford. While we've had our fair share of cold nights in northern Illinois this month, we have to look back to February of last year to find when the temperatures fell below -14 degrees - which is what we had fallen to at 7am. Good news, we'll see plenty of sun today. Bad news, high temperatures will remain in the low teens. 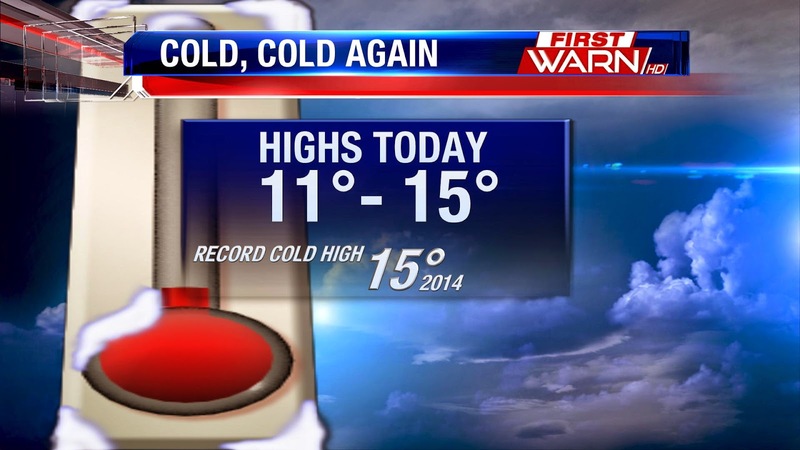 The record cold high for today is 15 degrees, which was set just last year. Highs today will range from 11 to 15 degrees. Stay warm! It's amazing to think how much of an influence the Great Lakes have on weather throughout the Midwest. 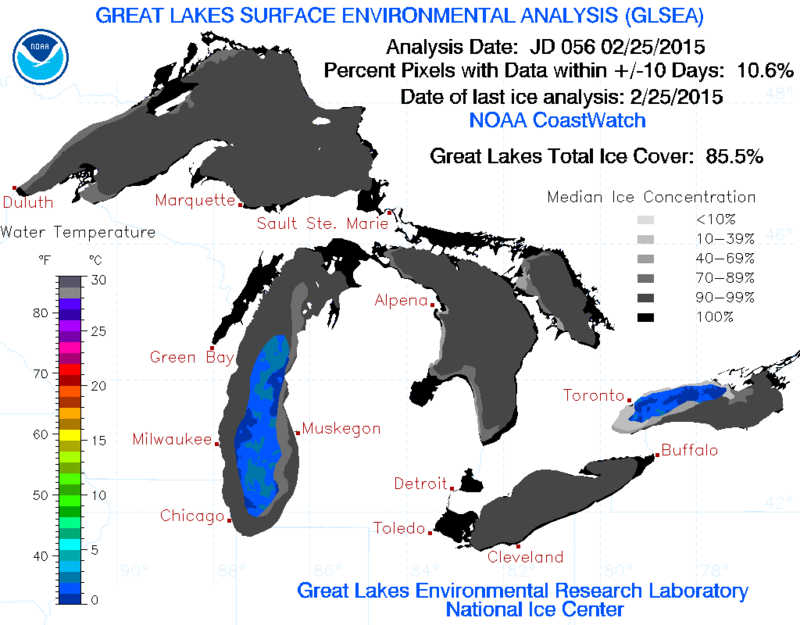 Great Lakes ice coverage is nearly 100% on Lake Superior, Huron and Erie. Total ice coverage over the lakes is about 85%. This time last year, ice coverage was only at 77%. Surprised? I know I was. You would think with the extreme cold we had during the winter of 2014, ice coverage over the lakes would be higher than this year. To find understand why that might be, you have to look at what happened weather-wise last year, versus what's been happening so far this winter season. I spoke with one of my good friends over at the Chicago National Weather Service, Lead Forecaster Matt Friedlein, and he said that the ice from last year came on strong late in the season, after not much at all through early February. "It was likely because of so many systems passing over the Great Lakes bringing us non-stop snow and for the lakes non-stop wind, so ice could not develop with any depth. This year, we have had regular cold high pressure systems in January and February to diminish winds and allow ice to thicken and persist." If the ice were to stay thick through the remainder of winter, which it may, then the start of spring could be cooler with a slower warm up into March and April. 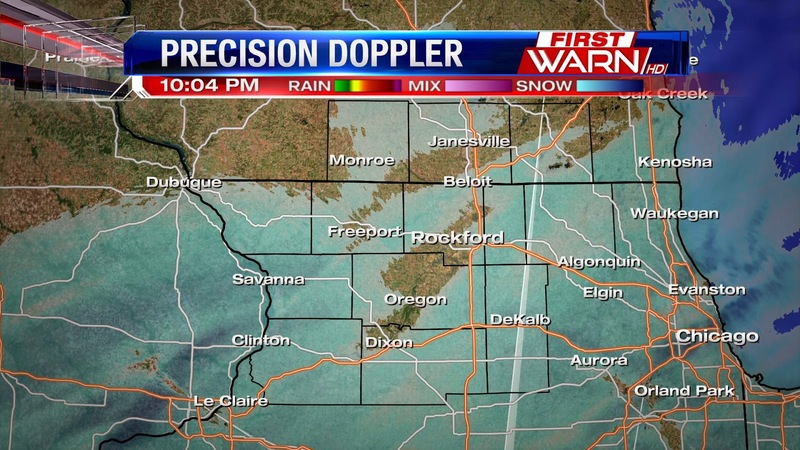 Snow showers could cause some problems for the evening commute, including slick roads and low visibilities. Take it easy if you need to hit the roads. Dixon (Weather Watcher) - 2.5"
A fast moving, but strong, low pressure system will slide through Iowa and Missouri later this morning and afternoon. This will bring heavy, accumulating snow through central and eastern Iowa, as well as in west-central Illinois where close to 6 inches of snow could fall. Closer to home, 1" to 3" of new snow is likely by Wednesday night. Just enough to freshen up the dirty snow from earlier this month. The commute this morning will be quiet with some sun. 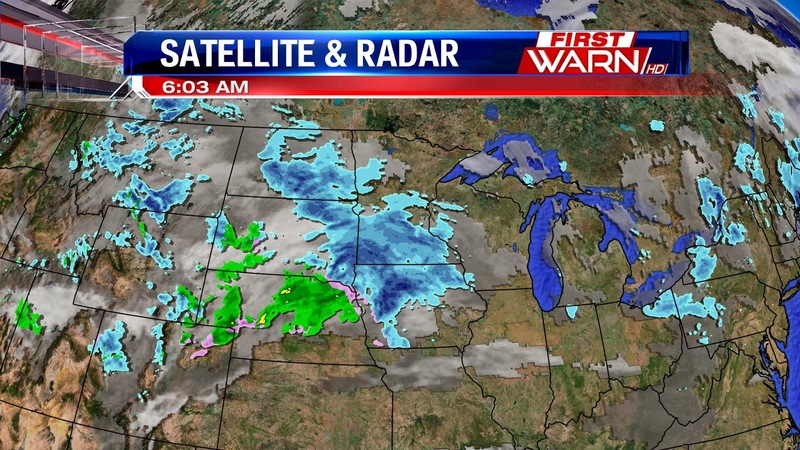 Clouds will quickly advance in from the west ahead of snow currently falling in central Iowa. While most of the snow will hold off until mid-afternoon, a few lighter snow showers may be able to reach the ground west of a line from Monroe to Freeport to Sterling around Noon. The snow will continue through the evening commute, which could cause roads to become a little slick with temperatures in the teens. Just a few flurries will linger through the morning Thursday before skies clear with high pressure by the afternoon. The high on Tuesday officially hit 33° in the Forest City. For this time in February, that would typically be considered cold. The average high for Tuesday sits at 38°. But this is the Midwest, so you never know what winter will give you. In this case, that high of 32° was a much needed warm-up. 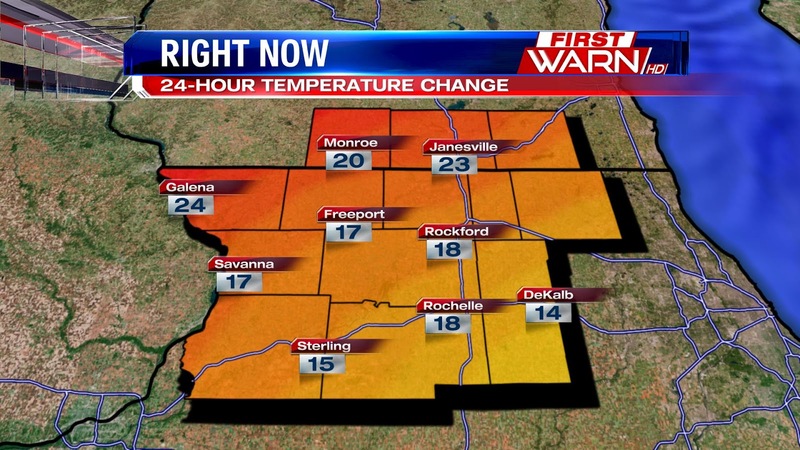 Temperatures Tuesday morning are nearly 20 to 25 degrees warmer than this time Monday morning. Not bad, right? Well, just step outside and that will change your thought. Despite the southwest wind, wind chills have fallen between -5 degrees to -15 degrees area wide, bringing wind chills down near where they were yesterday morning, if not colder. As the temperature goes up, the wind chill will ease. But, it will still feel more like the single digits and low teens this afternoon. 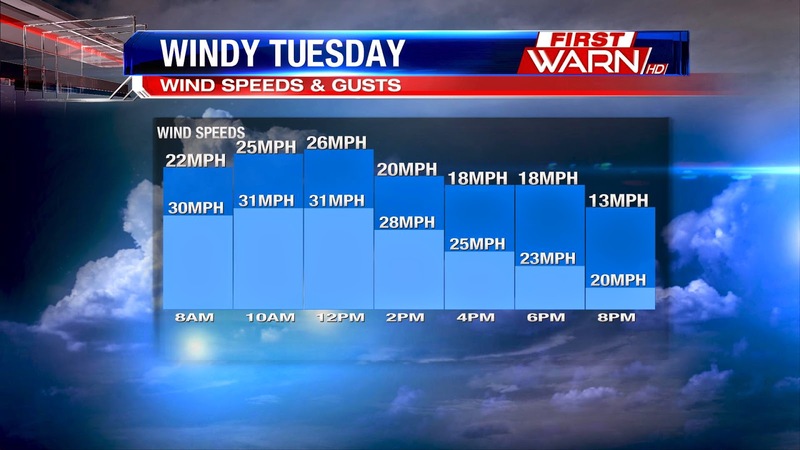 Southwest winds will be at their strongest through early afternoon with gusts nearing 33 mph. While the wind gust will ease a little tonight, they'll still remain elevated bringing wind chills back below zero tonight. Not only will we have multiple chances to see record cold this week, February 2015 could be colder than February 2014. If you don't remember, last February was part of our endless winter. Let's start with the records. 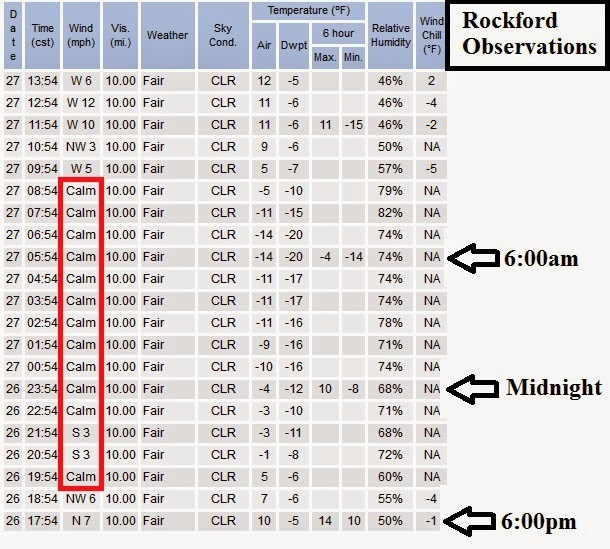 Monday's high of 9° in Rockford blew away the record cold high of 17° previously set in 1934. We also came close to the record low, but our -8° recorded at the airport fell a few degrees shy of the record low of -12° set back in 1910. 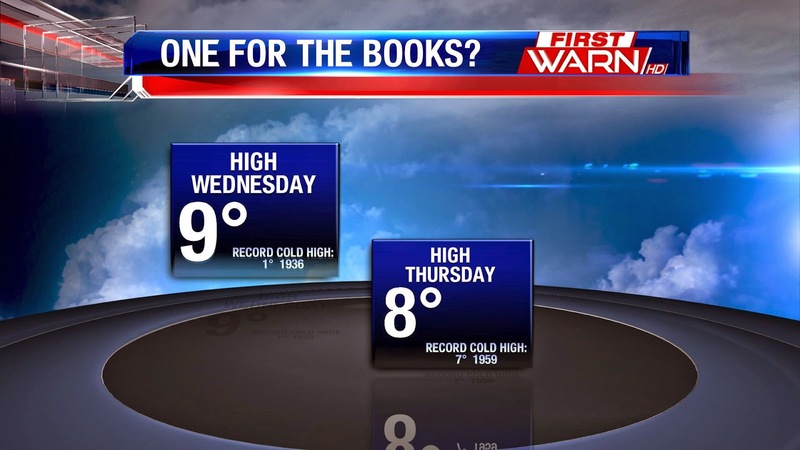 As for records that are still in jeopardy this week, we could see record cold highs on Thursday (11° / 1920) and Friday (15° / 2014) in Rockford. Remember last February? After averaging all the highs and lows together, February 2014 was a whopping 13.5° below average. As of Monday, February 2015 is 11.2° below average. 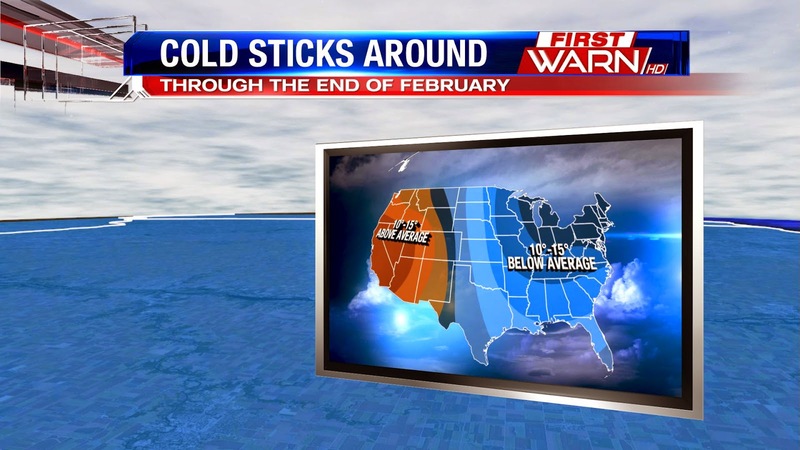 If the forecast holds, this February would once again be about 13° below average. the cold temperatures will continue to be the focus tonight and tomorrow. We will be close to another record tonight, with an overnight low temperature forecasted to hit -10°, with the record being -12°. Along with tonight's cold temperatures, winds from the northwest will create cold wind chills. A Wind Chill Advisory is in effect tonight through Monday morning, with wind chills dropping to near 30° below. The cold sticks around for Monday as well with temperatures only warming to near 10°. The good news is that it will be another sunny afternoon. All this cold weather is due to another arctic high pressure system moving into the Midwest. High pressure originating over the arctic carries the characteristics of being dry but extremely cold, it also brings clear and sunny skies. With the lack of cloud cover though, the 'warmth' won't be insulated and temperatures will drop overnight. We do see a bit of a warm up on Tuesday, with temperatures warming into the upper 20s, but then temperatures drop back into the teens for the rest of the work week. We'll get a little bit of everything this weekend; temperatures on Saturday were able to climb into the upper 20s and to 30° with mostly cloudy skies. 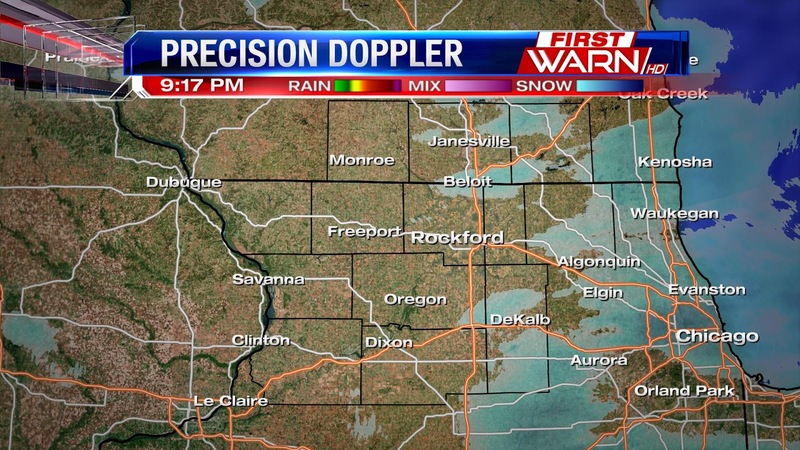 We also picked up a little light snow, but good news is the bulk of the snow fell to the south in central Illinois. 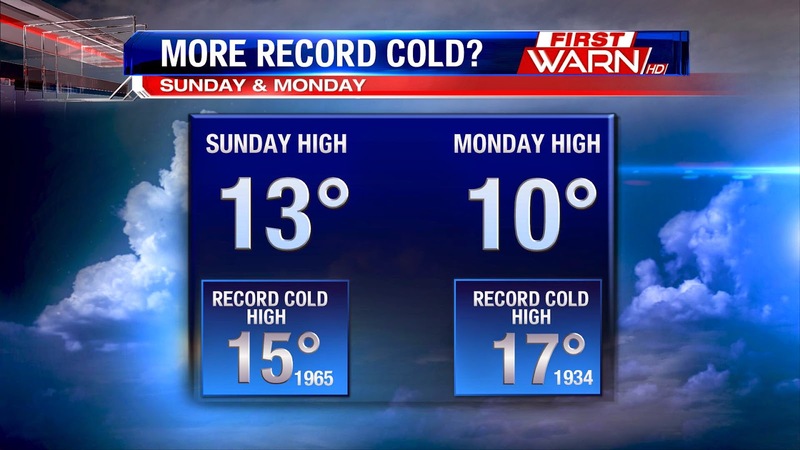 We trade in the more mild temperatures and clouds for sunny skies and possible record breaking cold on Sunday. High temperatures are forecasted to hit 10° tomorrow, but then will fall through the afternoon. Winds will also pick up from the north tomorrow and will create cold wind chills. 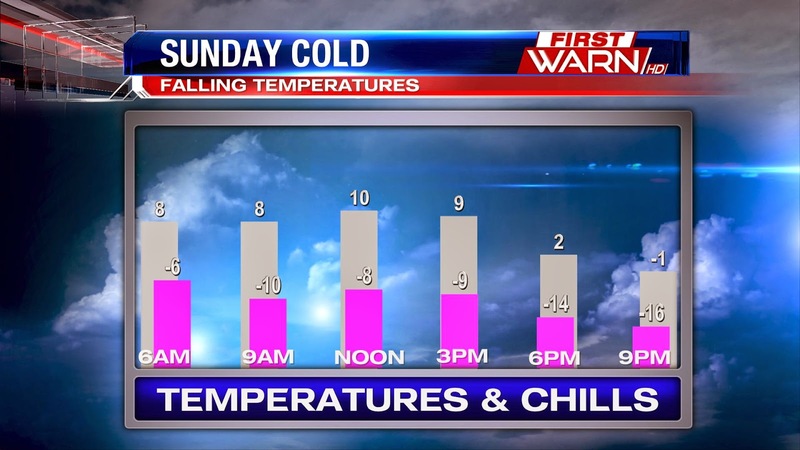 As temperatures fall to near 0° in the afternoon, chills will fall into the negative teens. More possible record breaking temperatures are possible Sunday evening and Monday as well. High pressure building into the area will keep the sun in place and will also keep snow chances low. More record cold on the way? Could be! Following Saturday's cold front will be another surge of cold air Sunday and Monday of next week. While it might not be as bone chilling as this week's, record cold high temperatures will once again be in jeopardy. Forecast high for Sunday is only 13 degrees with 10 degrees expected Monday. Record cold highs for both days are in the mid teens. Even if we don't break the records, temperatures will still be nearly 20 degrees below average to the start next week. After breaking a record cold high temperature Thursday afternoon, it would only seem right that we would add up a little snow to the start the weekend. It's not going to be much, a dusting up to an inch, but it will come with a little wind through the morning. 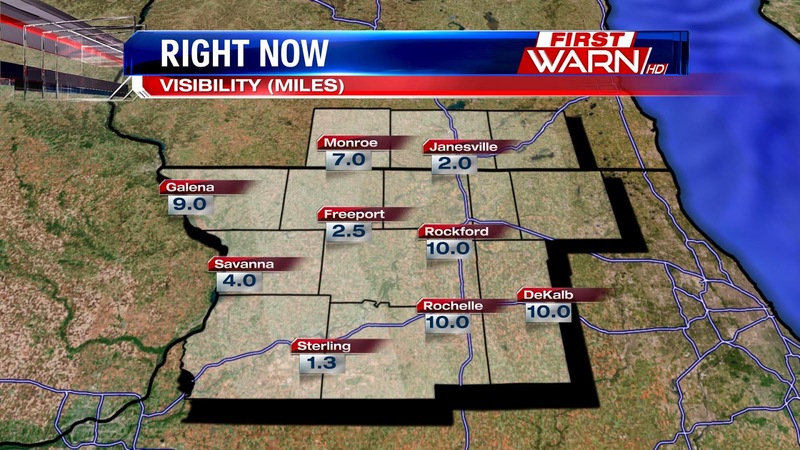 As the snow continues to pull through, visibility will be lowered to less than two miles from time to time. That wind dropped wind chills Friday morning as low as -20 degrees in some locations. The temperature continues to go up under cloudy skies and south winds, but the wind chills remain below zero and will do so through the early afternoon. Highs today won't likely be reached until late in the day. Temperatures will briefly go up Saturday, but then we'll be back in the deep freeze Sunday and Monday of next week, with more record cold highs possible. I'll have more on that shortly. If we had this type of cold in December or January, overnight temperatures would be nearing record lows and afternoon highs would have a hard time getting above zero. Hopefully, this will be the last deep freeze we feel until next winter. Unfortunately, it's not going to be the last of the below average weather this winter. Temperatures this morning have fallen as low as -12° in some locations with wind chills dropping to -30°. The coldest wind chills will be felt through 9am with a northwest wind around 10 mph. High pressure sliding in this afternoon will allow for a lighter wind, but even then wind chills will still be near -10 degrees. Some moderation will occur with the temperature through the weekend, but it looks like highs next week could fall 10 to 20 degrees below average once again. Multiple records look like they will fall on Thursday thanks to the unusually cold weather. 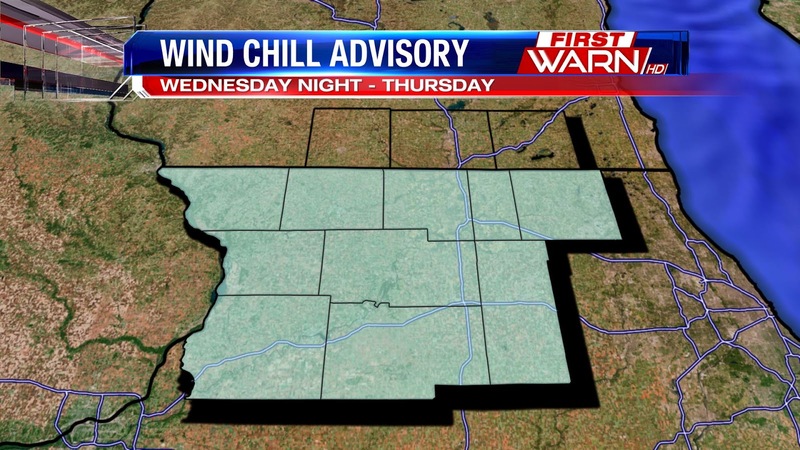 A Wind Chill Advisory will go into effect Wednesday evening and continue through Thursday morning. Wind chills Wednesday morning have fallen between -15° and -20°, but will drop to -25° by tomorrow morning. Even though the wind will lighten up through the afternoon, wind chills will remain below zero with temperatures climbing to 8°. We've been talking about it all week, and our next round of frigid cold air is set to start moving in overnight. 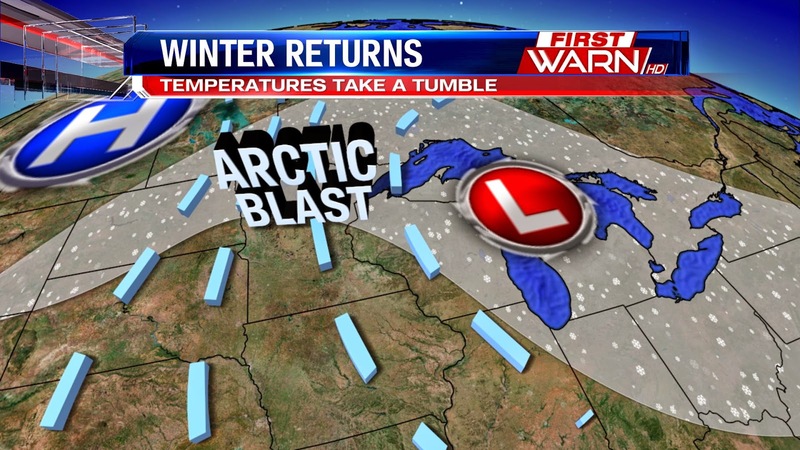 Here's our next cold blast at a glance. While actual air temperatures will be similar for Wednesday and Thursday, wind chills will be considerably worse Wednesday night due to stronger winds. Don't be surprised if we see a Wind Chill Advisory during this time. 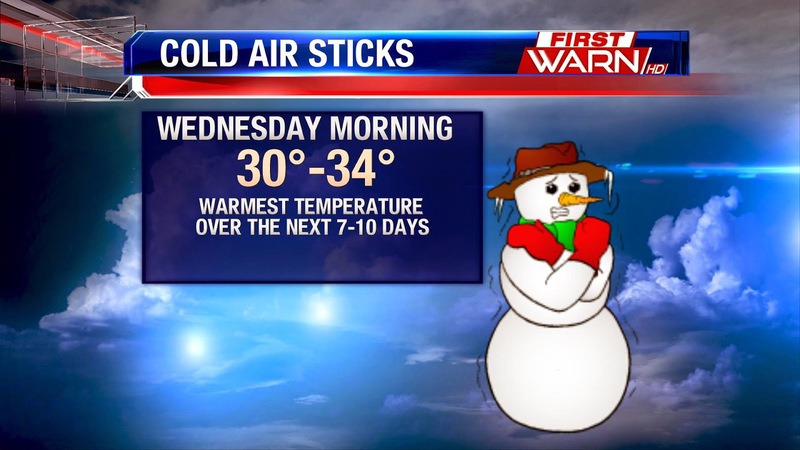 Near record cold possible this week. We've had our fair share of cold this winter season, but at least the cold hasn't lingered much more than a week. That's going to be the case again by the middle of this week, but when you're talking about highs that may not make it above 10 degrees, it's cold no matter which way you look at it. Two cold fronts will come through this week. The first arrives Monday night with the second coming Tuesday night. It's behind Tuesday's front when temperatures will really plummet. Highs for both Wednesday and Thursday may not make it above 10 degrees, with overnight lows falling below zero both nights. Winds chills Tuesday night through Thursday night could fall within the -20° to -25° range, with daytime wind chills falling to -15°. To make matters worse, highs on Thursday could be approaching record cold territory. The record cold high temperature (coldest high temperature) is 7 degrees set back in 1959. The forecast for Thursday calls for a high of only 8 degrees. Good news, the extreme cold won't last as it looks like we're back in the 20's for the weekend. It does appear, though, that we'll stay below average into next week. Just think, only 32 more days until the official start to Spring!! Got plans for Valentine's Day? It's not too late to have a nice, quiet night at home. Looking at the forecast, it might be a more romantic gesture to not go out! The forecast starts with temperatures going the wrong way heading into the afternoon. Morning "lows" will start at around 10° before cooling into the single digits for the afternoon. We could see a light snow shower or flurries in the morning, but the bigger story will be the wind and how it makes the cold even worse. Because of frigid wind chills, the First Warn Weatherisk will be at Moderate. Wind chills will be below 0° Friday night and get progressively worse into Sunday morning. 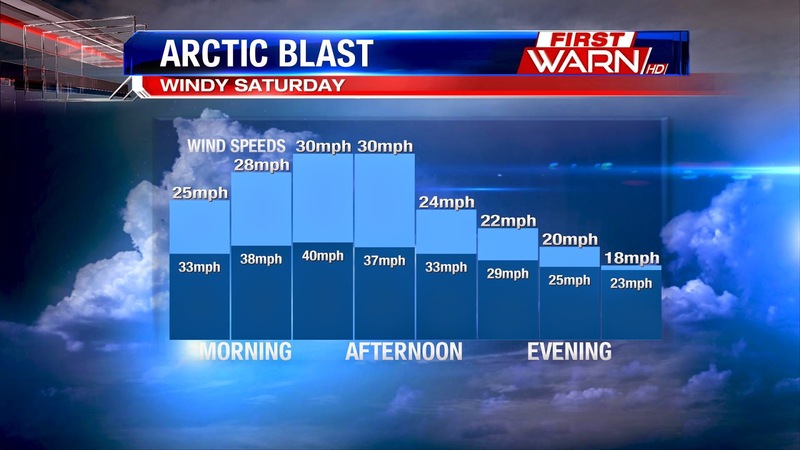 Winds could gust as high as 35-40mph during the day Saturday. Even with winds calming Saturday night, temperatures will plunge below zero, meaning it won't take much wind to get wind chills as cold as -30° by Sunday morning. It's an Arctic air mass that will not only bring the cold for the weekend, but the wind as well. A strong, Arctic cold front will move through around Midnight Friday night. Winds will quickly increase from the northwest once the front passes. Temperatures will fall only into the low teens tonight with light snow likely forming along the front through Saturday morning. Northwest winds will gust to 30 mph overnight Friday, but then increase Saturday morning. The strongest winds will occur through Noon Saturday where wind gusts could reach close to 40 mph. 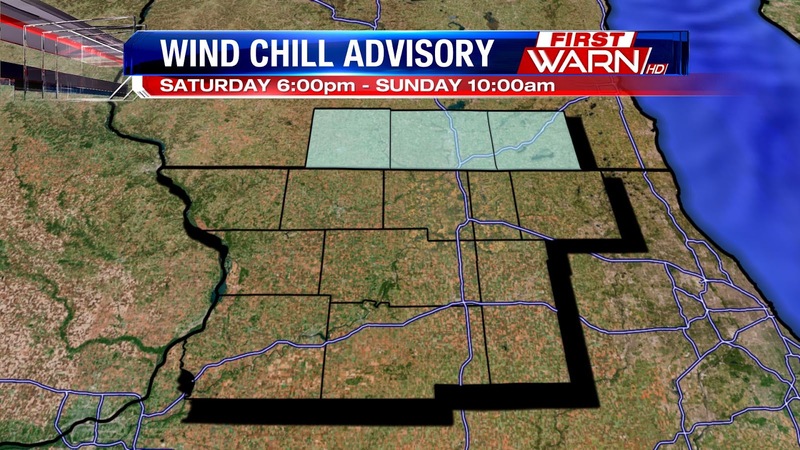 A Wind Advisory may be needed for parts of the Stateline Saturday morning. The wind combined with temperatures right around 10 degrees will force wind chills well below zero during the morning. The wind will lighten up a little Saturday night, but at the same time temperatures will fall below zero. 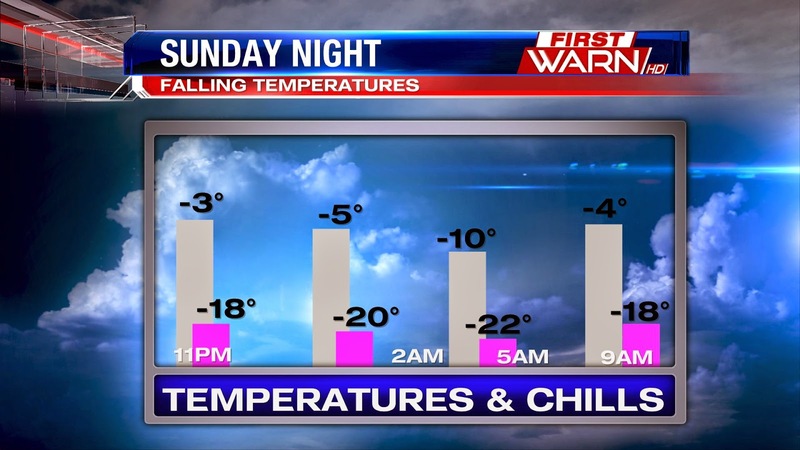 This means wind chills will fall near -25 degrees to -27 degrees by Sunday morning. It hasn't been too long, February 5th was the last time the temperature was in the teens, but January 7th was the last time the temperature failed to reach 10 degrees. The high temperature Thursday was 16 degrees, but that was at midnight. Since then, the temperature has fallen with each passing hour under clearing skies. Temperatures today will likely remain in the upper single digits to the low teens this afternoon, despite all the sun. 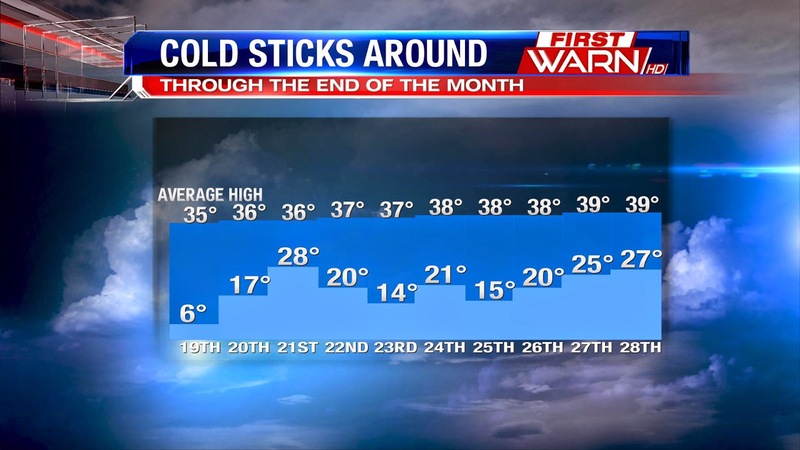 While there will be a few 'warm ups' here and there, highs the rest of the month may fail to reach the low 30's. Long range forecasts continue to indicate temperatures will remain 10 to 15 degrees below average across a good portion of the country. Next week, another shot of cold air spills down through the middle of the country straight down through Texas, Louisiana, Alabama and Mississippi. We may start to turn the corner the first couple days of March, but it doesn't look like we'll begin to warm up any time soon. 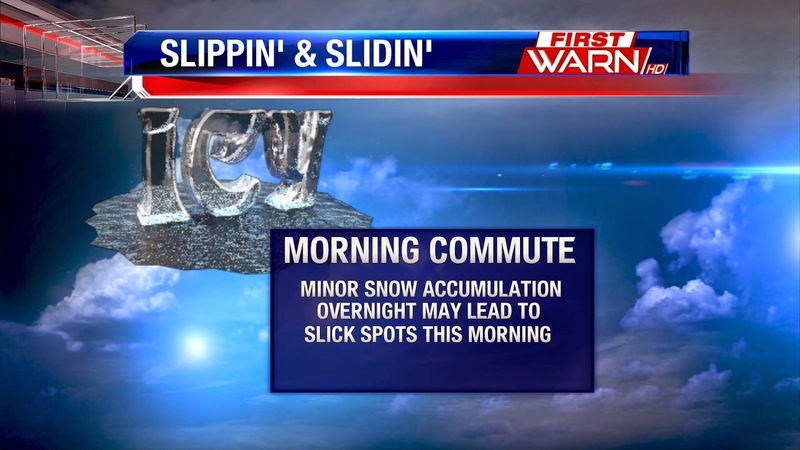 The combination of light snow and temperatures in the teens overnight has caused roads to become slick this morning. 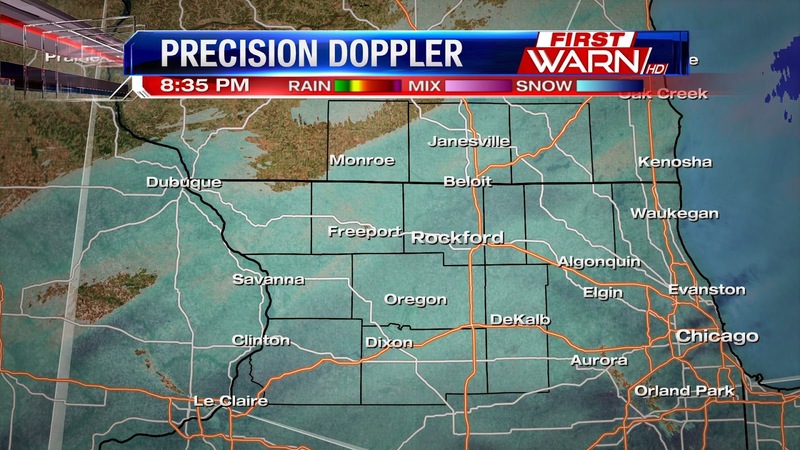 There was just enough snow to produce a dusting up to a couple tenths of an inch, making untreated roads slick. Use extra caution on the commute and give yourself a little extra time. Road conditions will improve throughout the day. Temperatures Wednesday morning range from around 30 degrees up to 34 degrees in Sterling as of 6:30am. Unfortunately, these temperatures look to be the warmest we'll experience over the next week and a half...maybe even longer. Average highs this time of year should be in the low 30's. Looking out long range, it doesn't appear as if any warm up is in the cards, and there could even be a colder snap coming up towards the middle of next week. If it makes you feel any better, last year our record low for today was -21°! See, it's not that bad. If you're looking for any warmth, you're going to be looking for a long time. Long range forecasts through the end of February continue to show any signs of warmth lacking as below average temperatures hold tight through the Great Lakes and Northeast. This will all be due to a strong ridge of high pressure building out west, forcing the jet stream to buckle across the middle of the country. The first taste of the cold will arrive Wednesday night. A fast moving clipper system will swing through the upper Great Lakes. With it, a light mix of snow and sleet will be possible Tuesday night into Wednesday. Wednesday morning temperatures will start in the upper 20's/low 30's, but then drop throughout the afternoon and evening as north winds increase during the day. Behind the clipper, temperatures will struggle to get out of the upper teens straight through the upcoming weekend. It will be a pretty active pattern of low pressure/high pressure, low pressure/high pressure. 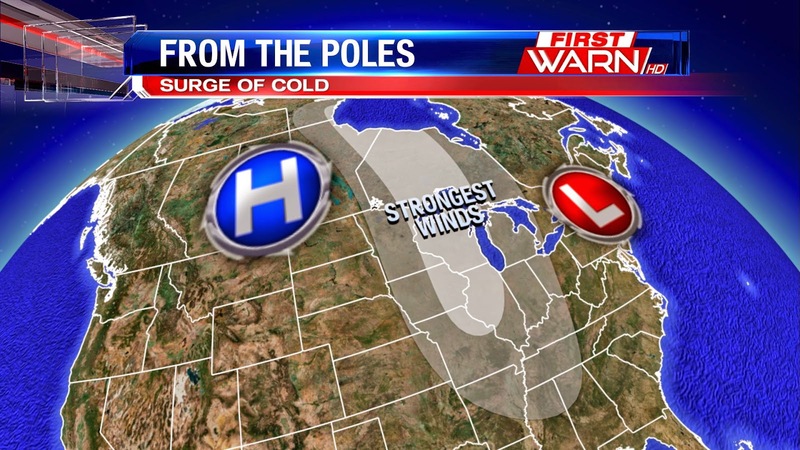 Each low that passes this week will be followed by strong high pressure, reinforcing the cold in the Stateline. ﻿﻿Accumulating snow looks low through this week as most of these systems will move mainly through Wisconsin. Next week, however, the jet stream pattern will begin to shift as low pressure forms in the southwest. This is something our models have been latching on to for some time now, which gives us a little more confidence that there may be some accumulating snow for the Midwest and Mississippi River Valley sometime during the Tuesday/Wednesday time frame of next week. It was a beautiful day across the area, despite the large snow pack, temperatures were able to warm into the upper 30s and lower 40s. Upper level clouds also hindered some of the warming, but not bad for a February afternoon. A lot of snow was able to melt today with the warm air and sunshine, and with the added moisture in the atmosphere fog with be able to develop. Winds will become light tonight with a Low pressure system overhead, and that will also aid in fog development. Added lift from the Low with help to drive a light winter mix for tomorrow. With temperatures hovering close to freezing, we could see freezing rain mixed with snow. Accumulations will be fairly light, but could cause some slick roads. Monday will be sunny with temperatures in the mid 20s. Look at these overnight temperatures! Thankfully, Thursday night isn't looking nearly as cold. Southwest winds and increasing cloud cover will cause temperatures to rise overnight into Friday morning. While temperatures will warm into the weekend, we won't feel the full effects of it thanks to snow cover and fog. Temperatures a few thousand feet above the surface will warm well above freezing, but closer to the surface remain right around 32 degrees. 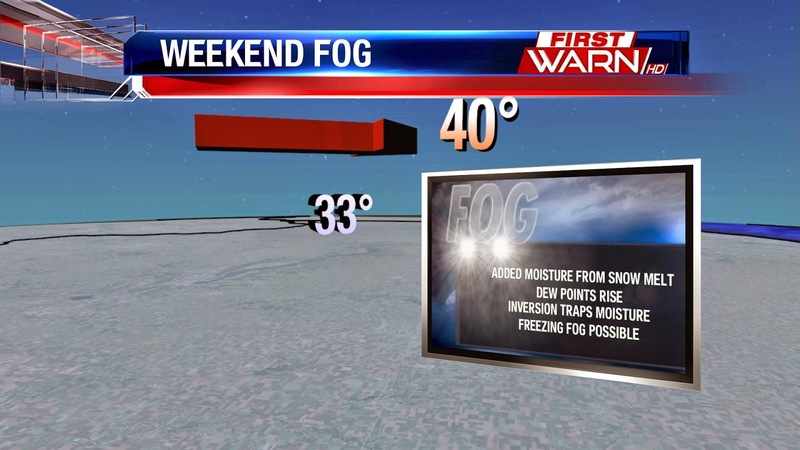 With the warmer air Friday night into Saturday this will cause what meteorologists call an 'inversion' to develop. Inversions during the winter time are usually notorious for keeping cloud cover and fog around. With the added moisture in the atmosphere from some snow melt Thursday and Friday, fog will likely form overnight Friday. With temperatures still below freezing, freezing fog will be possible by Saturday morning - and likely throughout the day Saturday. The combination of cloud cover, fog and snow will limit how far temperatures rise on Saturday. Highs will get close to freezing, but not too much above. Saturday night will be relatively mild as well, but light freezing rain will be possible Sunday afternoon with another clipper that moves through by Sunday night.